London Councils undertakes annual air quality polling work to understand the level of public awareness around, and attitudes to, the issues arising from air pollution in London. There is a lack of information/data on public opinion on air quality specific to London, which our polling data is addressing and therefore will provide some much needed information for policy-makers. This information will inform our positions on air quality, and feed into London Councils’ responses to key relevant consultations on air quality, including the Clean Air Bill which is due to receive its second reading in the House of Commons soon and the ‘upcoming’ Clean Air Strategy. The importance the public place on air quality as an issue in their lives. Whether air quality issues affect their decision making (for example in relation to travel arrangements, living locations, school selection). The public’s understanding of the problems and challenges caused by air pollution. The negative impact air quality has on a number of issues, such as the workforce and economy, physical and mental health. Who the public believe is responsible for tackling air quality. Whether the public support measures to tackle air quality. What would encourage the public to change their behaviour in certain areas. How to influence the Mayor’s office and the government on this issue most effectively. The change (if any) of the public’s understanding and awareness of air quality issues over the last 12 months including in relation to the EU role. 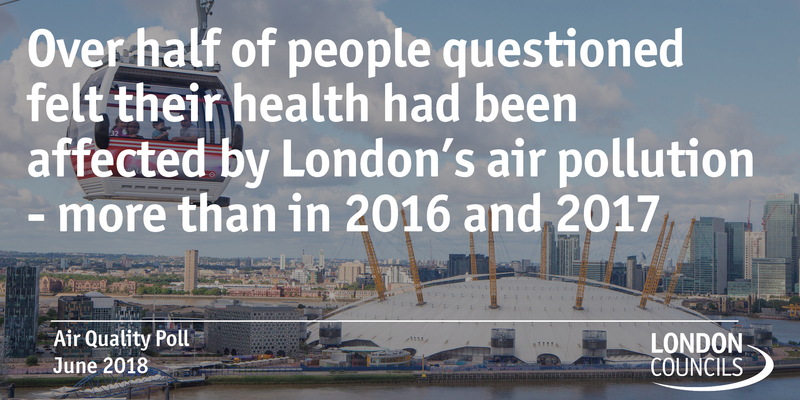 Our air quality polling work will information will inform London Councils’ position on air quality and help steer our responses to key consultations and policy development work with external stakeholders.